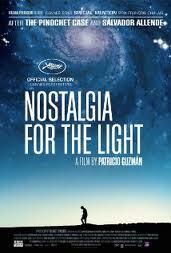 Last night I watched "Nostalgia for the light", a documentary directed by Patricio Guzmán, and it made my night. In this wonderful documentary there is astronomy, history, really touching stories, archeology; the "story" is set in the desert of Atacama in Chile. The documentary is beatiful, interesting, fascinating and touching. It's mainly about astronomy, but after a while a lot of interesting stories are told about Chile's history, concentration camps, Pinochet's dictature and the horrible things he did, and how looking at the stars at night have helped prisoners and people who have lost the loved ones, to feel free and feel that there was hope for them. I loved it. I read many positive reviews about it, and I agree with all of them: It's worth watching! I recommend it, even if you are not a fan of documentaries, you should watch it! It's so beatiful and touching (I have to admit I shed a tear in the end). And sorry, if I haven't posted things in a while but I have been busy with school. Oh, and if you want us to write about something in particular or if you want to ask something just write it in a comment, we don't bite!